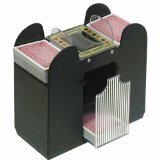 Make dealing a snap with this Automatic Card Shuffler. The battery-operated shuffler has a 6-deck capacity and shuffles standard or bridge-sized playing cards. Requires four C batteries (not included). Playing cards sold separately.